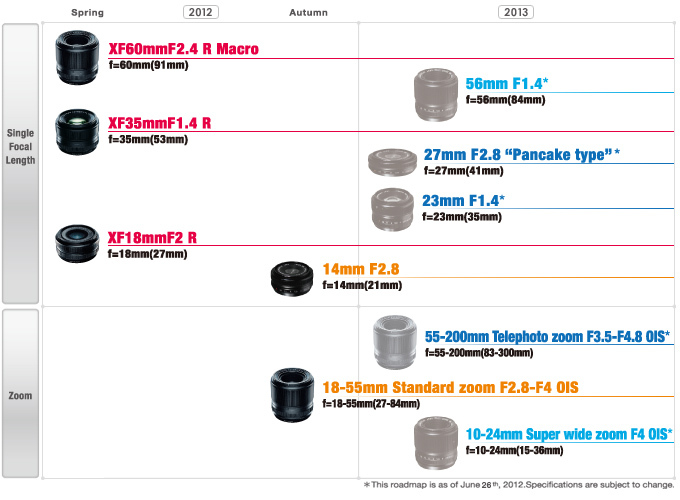 June 26, 2012 /Photography News - Fujifilm/ Fujifilm today announced to be going to expand the line-up of Fujinon XF lenses for a wider range of photography with the interchangeable lens camera, FUJIFILM X-Pro1. From super wide to telephoto, users will be able to freely choose lenses that match their shooting style or purpose, letting them enjoy high-quality photography with FUJIFILM X-Pro1 in various scenes. Since X-Pro1's announced in January 2012, users have given many requests concerning interchangeable lenses. In order to respond to such requests, Fujifilm will introduce, in autumn this year, a bright F2.8 super wide 14mm (21mm in 35mm equivalent) single focal length lens and a bright F2.8-4 zoom lens that covers the shooting range of 18mm to 55mm (27-84mm in 35mm equivalent), in addition to the three single focal length lenses in the first series of Fujinon XF Lenses. Another unique five lenses will be added in the line-up in early 2013, making the total to 10 lenses. * This is not the image of the final product. * The above road map is as of June 26, 2012. Specifications are subject to change.